Melody’s Progress Video (Click on the link above to see Melody’s 2 minute video of her latest developments.) Brandon, a remarkable young man in Canada who has Mosaic Trisomy 18 (meaning not all his cells are affected) noted in his high school graduation speech, “Sometimes the greater the challenge, the sweeter the victory.” In some respects that insightful statement sums up Melody’s life. 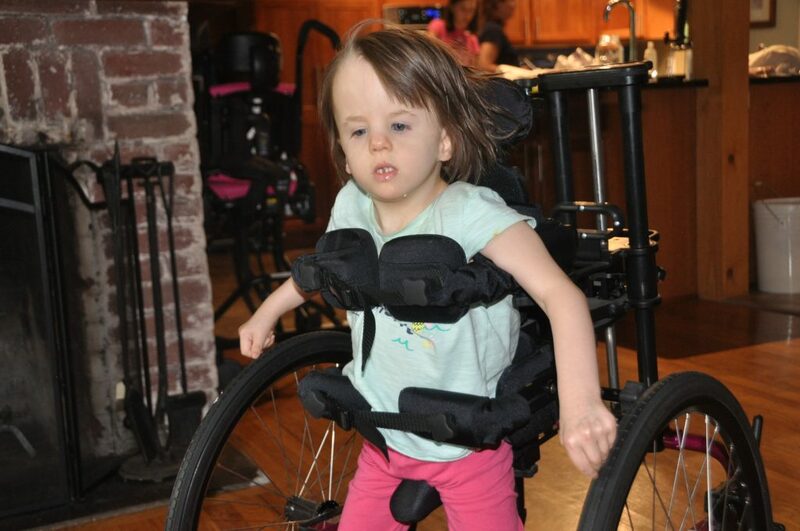 When Melody was 18 months old she was assessed to have 100 apnea episodes in an hour – ten is considered severe. Sandra Coulson, a speech therapist, helped changed all that. Melody no longer has sleep apnea. Her gut is now healed through the help of a natural practitioner. That is a assuredly a sweet victory. Her health is excellent. 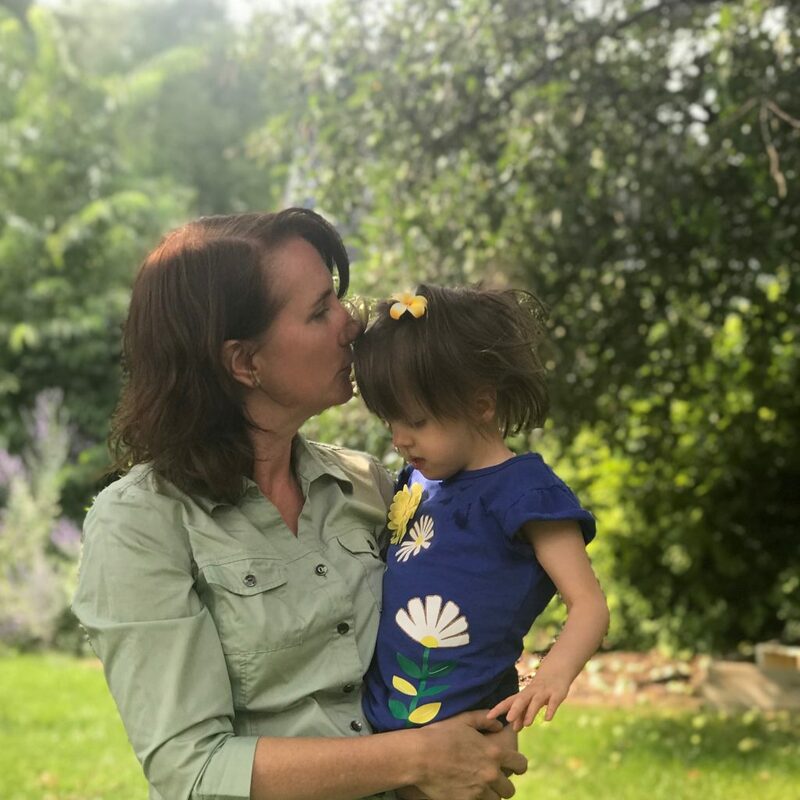 She is more vulnerable than our other children when she is sick, but she has no health issues per se, uses no equipment, and takes no medication. (She is certainly a far cry from the dangerous T18 label of “incompatible with life”.) The greater the challenge with health issues the sweeter the victory when they are remedied. We have seen stunning changes in her development lately, with great hope for more on the horizon. 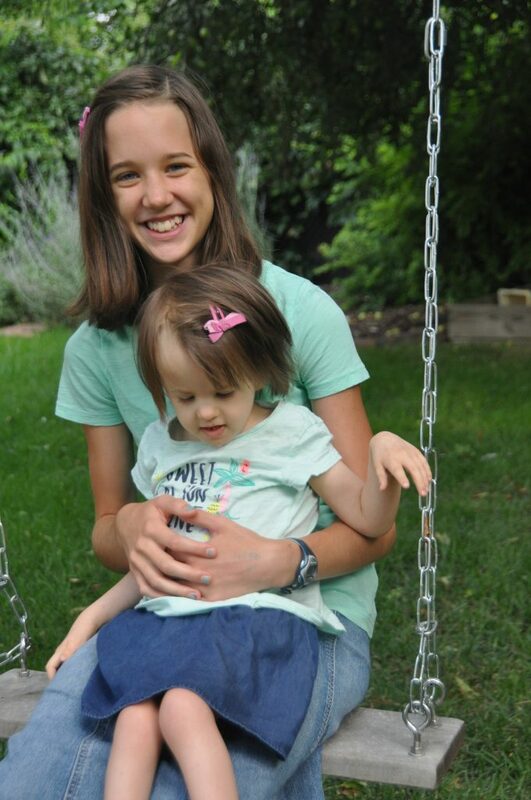 Melody started her occupational therapy with Dana and speech therapy with Kay almost a year ago. She subsequently added in physical therapy with Kellee. She has been blessed with a remarkable team. 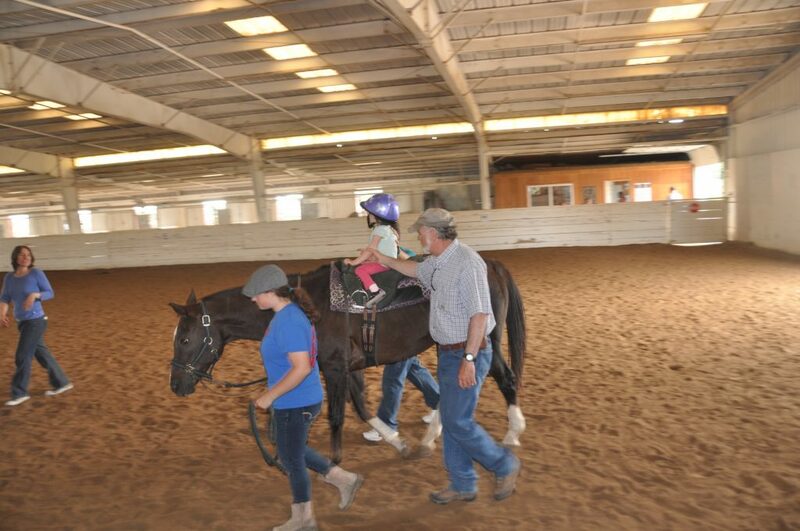 All three therapists are exceptional, and Melody has made significant progress with their help. 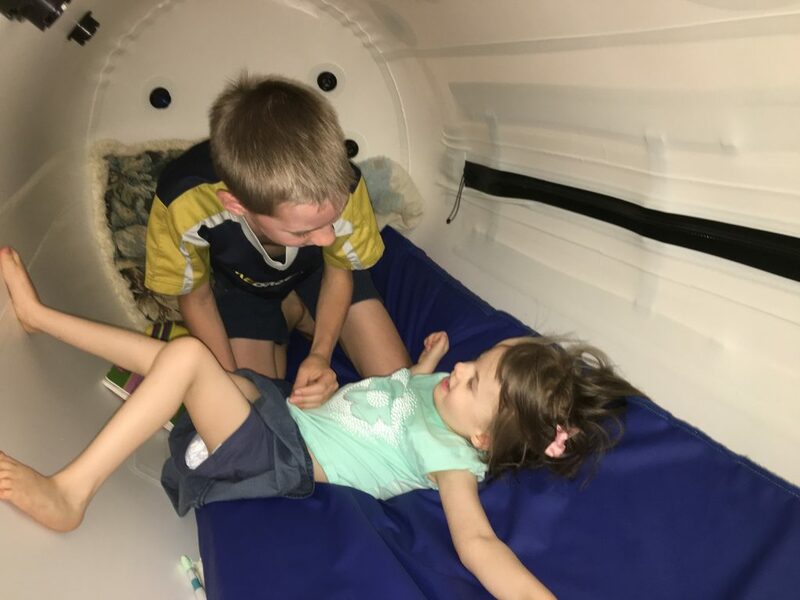 In addition to that we now have a hyperbaric oxygen chamber for her. Melody’s progress has been launched to a whole new level since adding this to her regiment. Every day is a new day around here. She is stronger and more interactive amongst other things. 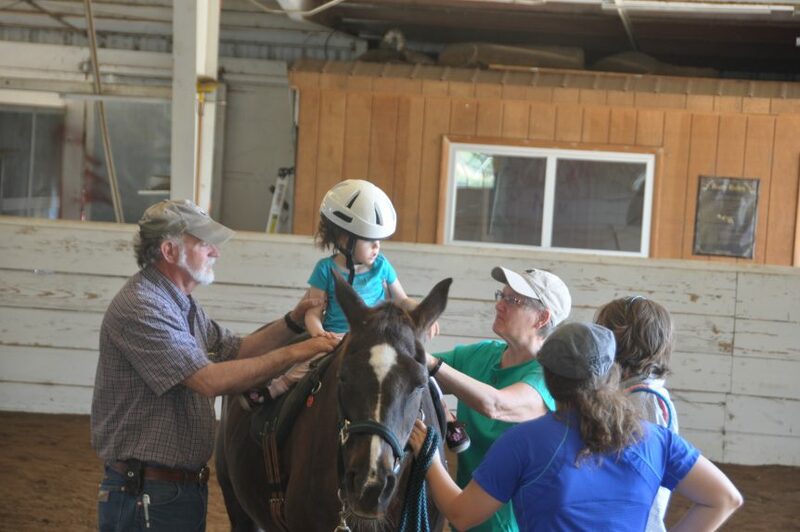 Melody’s occupational therapist recommended horse therapy even before she stepped foot in our home. We thought it was an excellent idea, but didn’t know how we could swing it with 6 other therapies (three therapies twice a week) plus a sundry of other things we do for her. The time has come for us to try our hand at it. I called Chris at Miracles and informed her that Melody does not walk. I inquired whether horse therapy might be beneficial for her. She responded by telling me several stories that brought tears to my eyes. 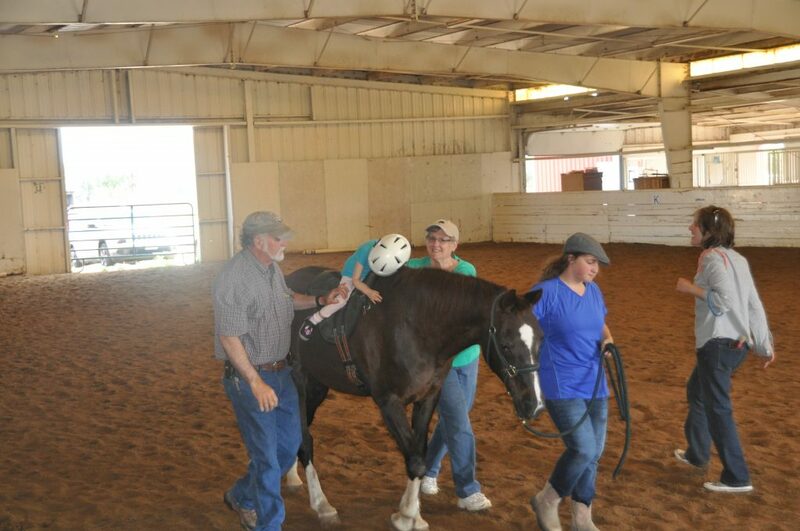 I have heard from several sources that horse therapy can produce astounding results. We believe it. After just one ride, Melody was so much stronger. 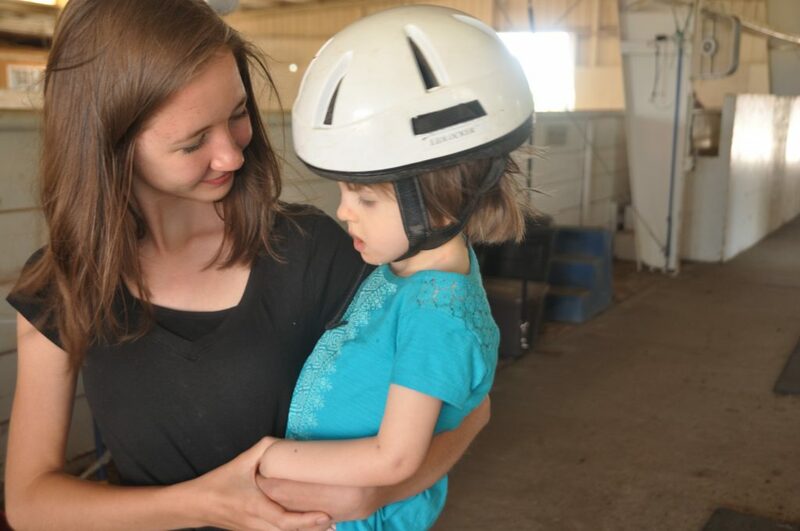 Two days after Melody’s ride, her physical therapist was working with her and she exclaimed, “You have a crazy amount of strength in your legs, Melody.” The change in her is remarkable. Melody’s physical therapist has not only noticed more strength in her legs, she is observing that Melody is engaging her muscles more. Her speech therapist is amazed at the cognitive changes in her as well. We have so much hope for our little girl. 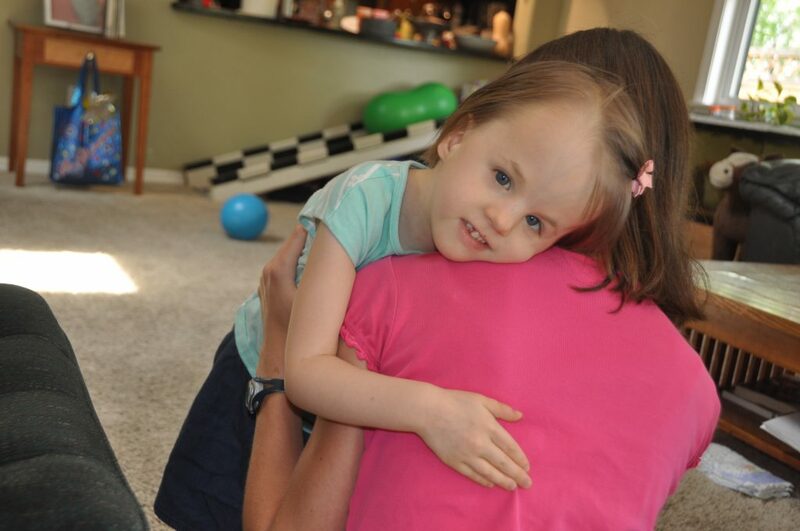 When a baby with Trisomy 18 is born, hope is not typically imparted. Our experience was consistent with that. It was an excruciatingly painful time for all of us. Yet here we are with great anticipation of what lies ahead for Melody. We have more hope for her now than we ever have. Hope is a precious thing. We are excited about Melody’s advances, but even more importantly our hope is in the Lord and His amazing Word. The more I read it, the more I appreciate it. I delight in His Word. As I read it each day, I often don’t want to set it down. We are thankful for a Book that was written by over 40 different people from all walks of life, from three continents, and using three languages. It was written over a 1,000 year time span, and yet there is consistency with every writer as to the teachings and nature of God. There are countless prophecies in Scripture that have been fulfilled. There are over 300 fulfilled in Christ alone. Therein lies our ultimate hope. Melody loves her books. 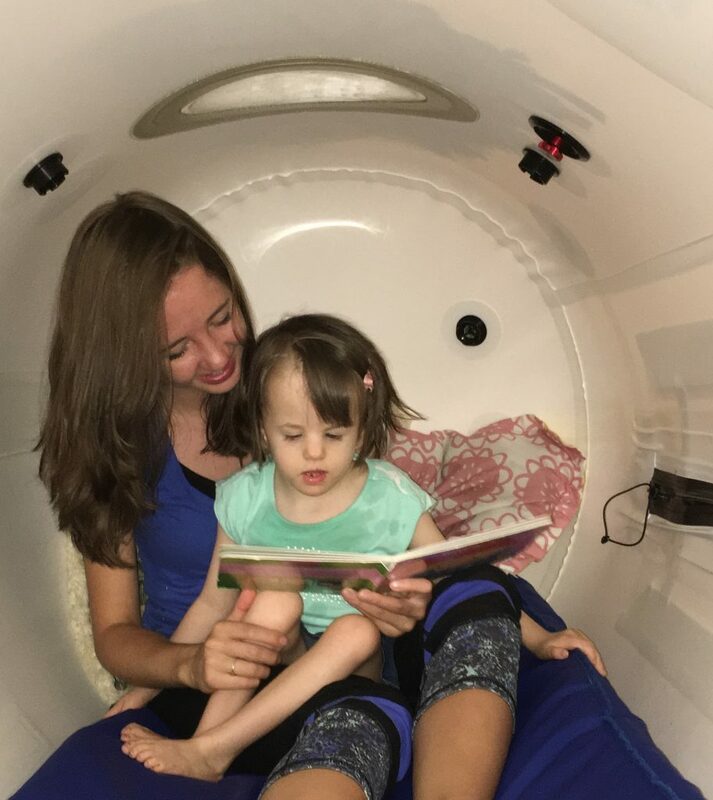 Here she is reading while doing her hyperbaric time. 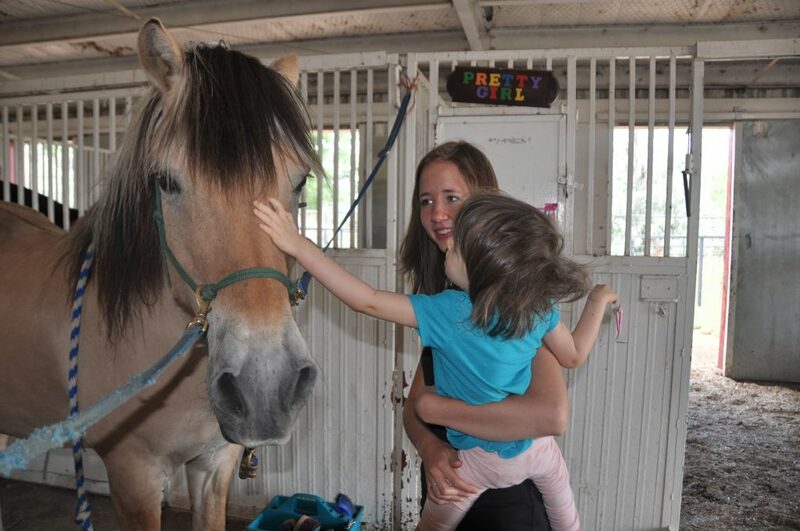 After Melody’s therapy she met this Norwegian horse and seemed to really like her. So proud of Melody for reaching out and petting her. She went up in Melody’s face at one point. Melody wasn’t quite sure about that, but she rolled with it. 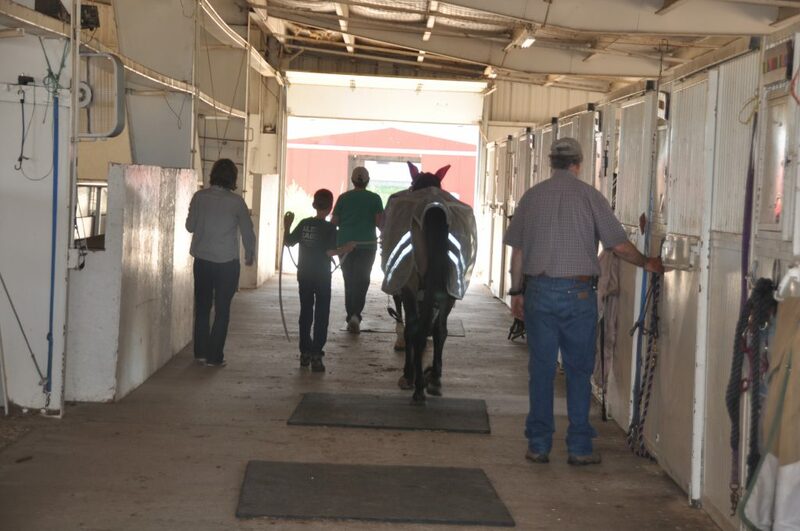 Melody’s brother was given the opportunity to lead Melody’s horse out to pasture after the therapy. He loved that! When Melody first used this gait trainer a couple of years ago her strength was so compromised that after two minutes in it, her legs were too weak to stand up (with assistance) for a couple of days thereafter. We shelved it for awhile realizing it was too much for her. Recently her physical therapist suggested we try it again. At first we pushed her in it, and we were pleased to see her little legs walk. She clearly has significantly more strength. When we stopped pushing her she would communicate that she wanted to keep going. After only a few times of this, she picked up on how to make it go by herself. 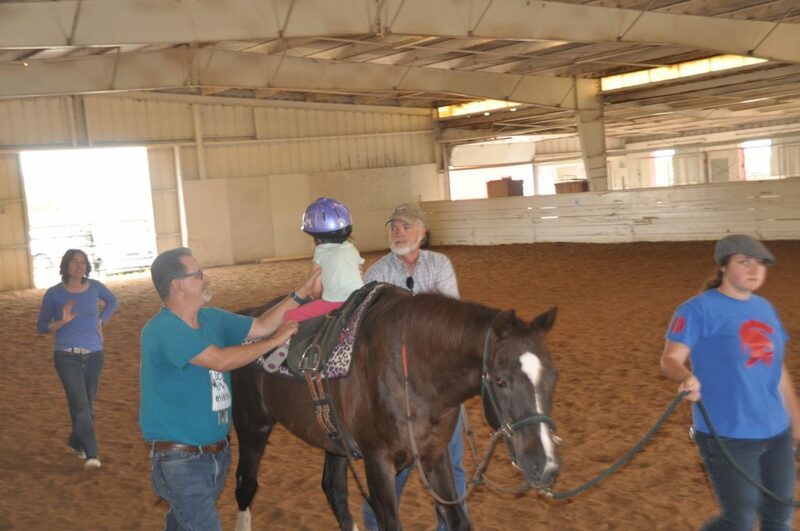 She walked across the room, sometimes going forward, sometimes backwards, and sometimes running into the piano. Two days after horse therapy she cruised across the room at an impressive and unprecedented rate. Go Melody! This has been a sweet victory. Melody does spend a significant amount of time doing therapy. She has fun doing it, but it is a great deal of work for her. 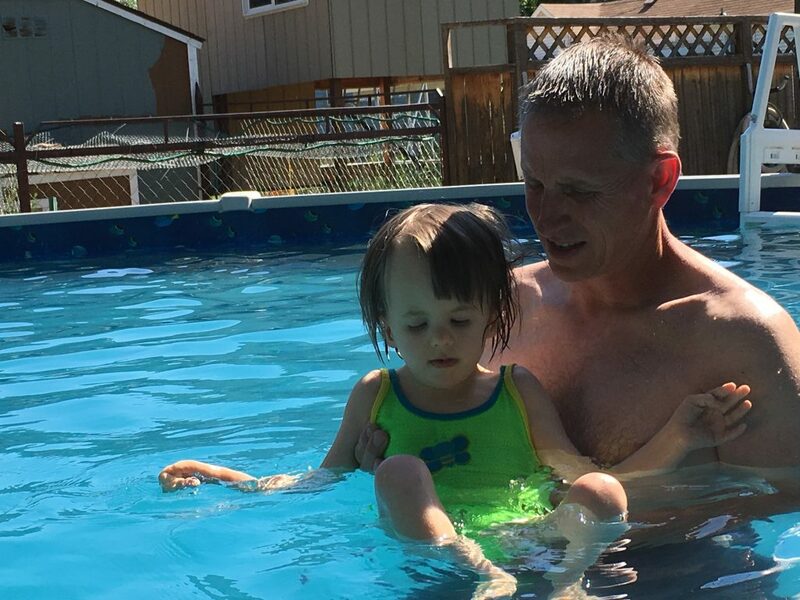 She does get some time to relax and play…like when she is swimming – she loves this activity! Melody is developing an appreciation for stuffed animals now. 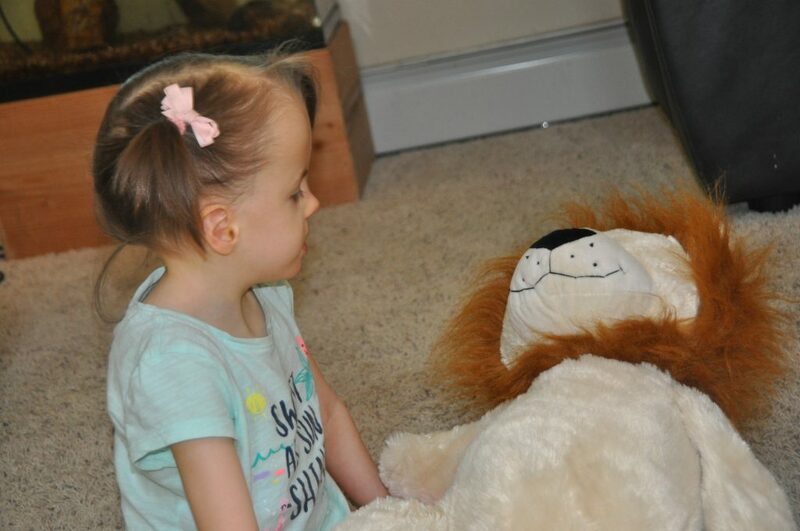 She loves her lion that her two aunts and uncles gave her for her 5th birthday. She is much more interactive with him than she used to be. Melody is so much stronger since the hyperbaric. 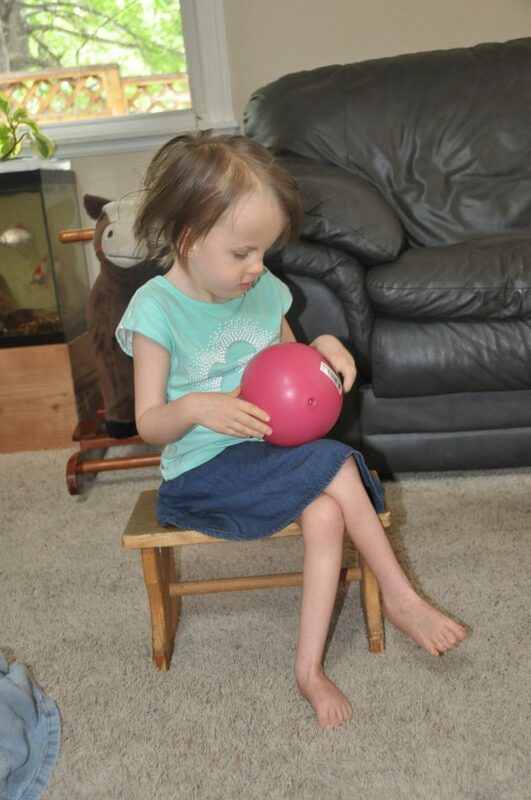 She can sit on her step stool, hold a ball, “talk”, and look around the room all at the same time. Not only that, if we let her hold onto our fingers she will stand straight up! Amazing! All this from a little girl who used to spend most of her life lying down. Definitely the greater the challenge the sweeter the victory. 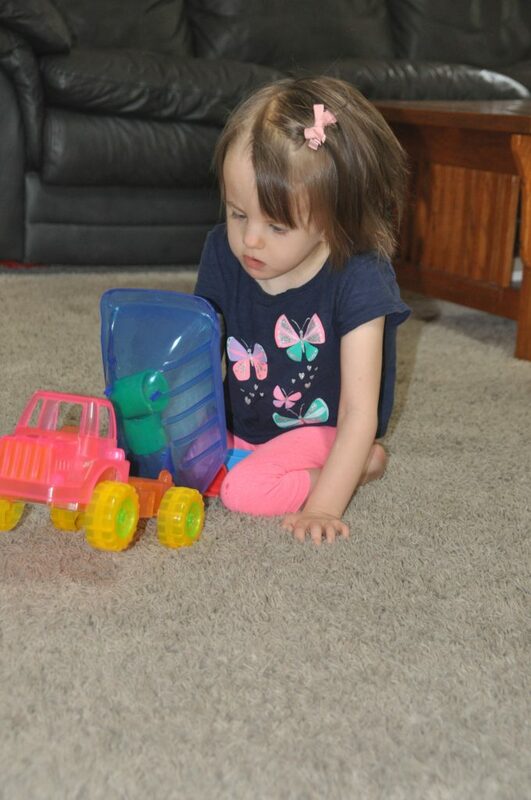 Melody’s occupational therapist has worked with Melody on teaching her to put blocks in her dump truck. 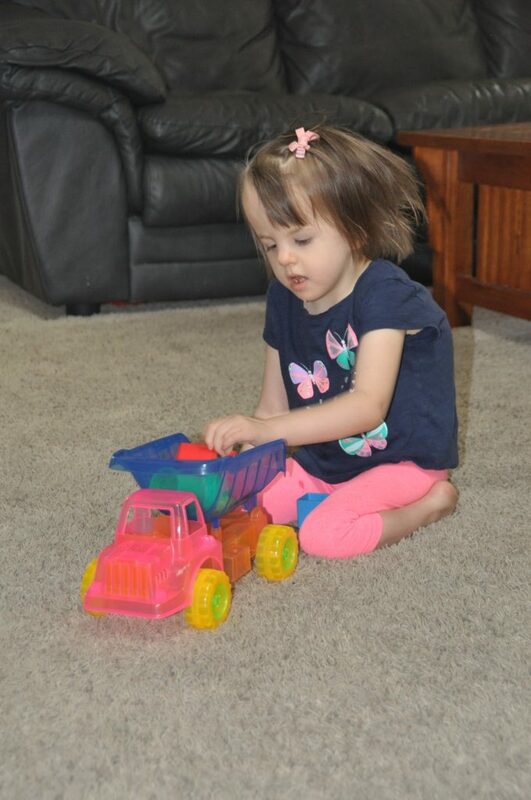 Shortly after the hyperberic treatments she started pushing her truck back and forth, putting blocks in the truck, and dumping them out. All from a little girl who did not used to care much about toys. The greater the challenge the sweeter the victory. Melody is learning how to give kisses, which indicates that her mouth muscles are getting stronger. Even more importantly, she is understanding that she is expressing love. Kay informed me the other day that when she shows Melody her picture cards Melody consistently leans down and kisses the picture of me.  She does not kiss the pictures of her toys like her cups or her ball. However, she kisses the picture of me. She just loves her mama, and it goes both ways! My friend Sarah gave Melody this doll for her 5th birthday. This little baby helps draw all kinds of things out of Melody. For example, if we pretend to have the baby drink from a cup Melody will sometimes drink from a cup (Kay’s idea). 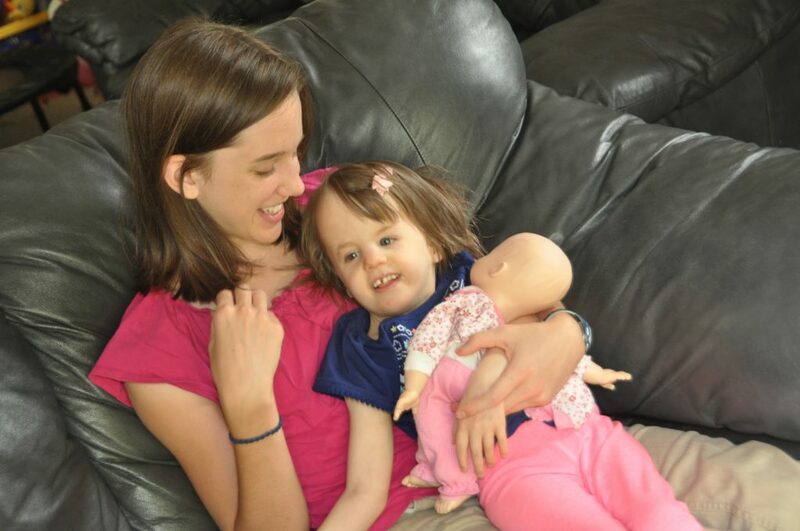 Yesterday during speech therapy Melody was holding, kissing, cuddling, patting, and talking to the baby. It was priceless to see her interact like that. Kay gave Melody a little cloth book that can hold pictures. She suggested that we put pictures in there of what Melody does each day so she can “tell” her daddy about her day. What a brilliant idea! Melody now has a tool to communicate what she does each day. 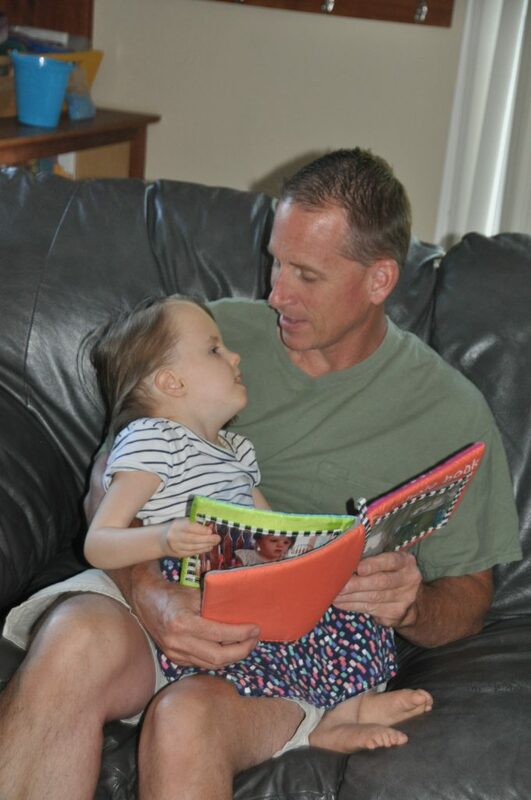 Melody tends to look at her daddy, look at the book, and then look back at her daddy. According to Kay the significance of this is extraordinary. She is clearly displaying a desire to communicate. Hot off the press: Melody just lost her 3rd baby tooth today! 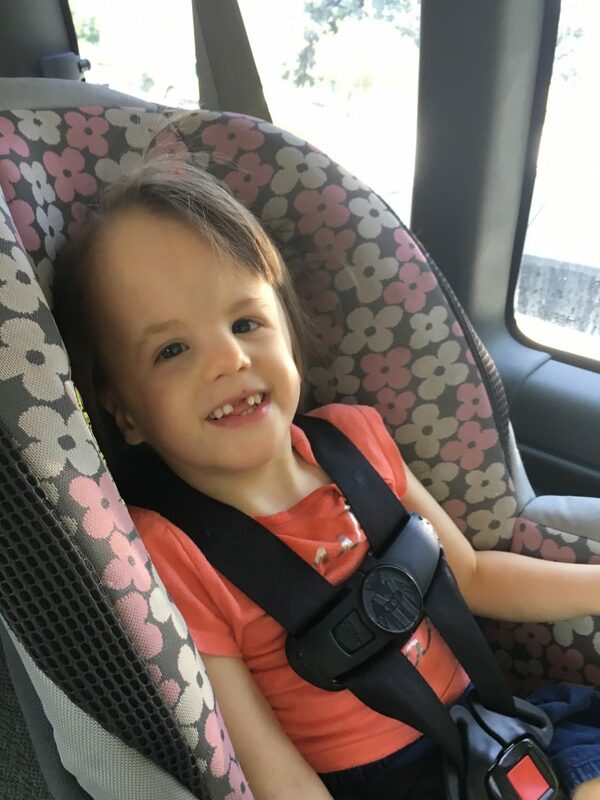 Although we were a little concerned about what losing teeth would entail with her, I have to admit that it is sweet to have her experience “normal” childhood events like losing baby teeth. She has actually been a little champ about it all, and it has gone quite smoothly. Melody is a little cuddle bug, and her cognition is remarkable. The other day her sister asked her to give her a hug and she did it! She does this consistently now. Taking that kind of direction is indicative of a remarkable shift. That is a sweet victory. Melody got into the fireworks this year. We had the perfect view from our driveway of a beautiful professional display near our home. 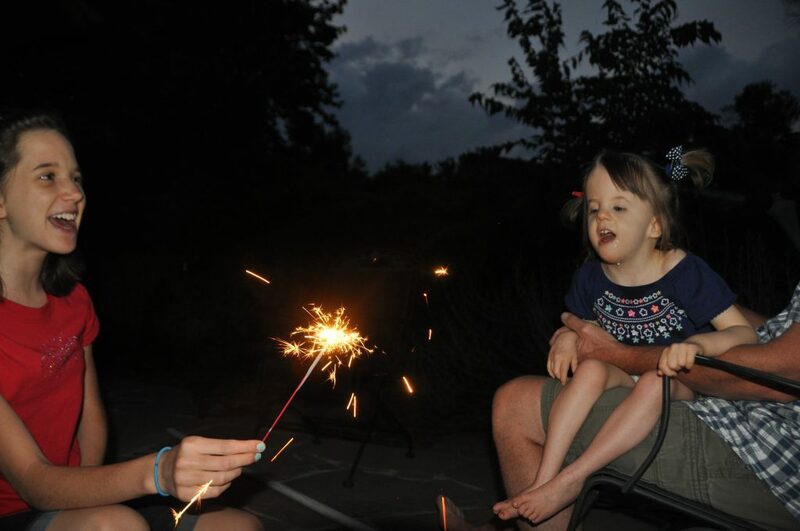 Here she is getting excited about a sparkler. Last year this would not have captured her attention. She is so much more interactive with her world now. You are correct, Brandon, the greater the challenge, the sweeter the victory! just amazing. What a change it has brought about. letter which I have on my website detailing Melody’s remarkable changes early in her life. Even some of the young doctors there came to talk with me with tears in their eyes. I am always so grateful to receive your BLOG and follow Melody’s progress. It is just incredible! Wow, wow, wow! Sweet victories indeed! I am always in total awe of Melody’s progress. The amount of love that is expressed between siblings and from Mom and Dad is worth it’s weight in gold. This precious little girl has redefined victory. Please consider writing a book to share her story with the world. God bless your family tenfold! Thank you for sharing this, Melody (and all of you) is such an inspiration! Yeah Melody! What a remarkable update! Once again, “The Little Engine that Could” DID! Melody looked so cute on the horse and it looked like the horse loved it too. Thank you for sharing the video and pictures. Her smile is infectious. I agree, write a book. Melody and your whole family are such an inspiration to all who have the pleasure of knowing her even if we have never met in person. Dear sweet Melody, your progress is amazing and seems to be on a definite “fast track” since February. My favorite picture is the one of you sitting on your little stool – with your legs crossed – looking every inch the precious little lady that you are. And now sitting on the back of that big horse – too cute for words. We have always been very proud grandparents at every little progress you made – but as Ephesians 3:20 says, God is truly taking you exceedingly abundantly above all that we have asked or even thought He would do. You are displaying His power and bringing glory to His name dear one and we are all privileged to be a part of your amazing story. . . . . And I have always said Melody’s Story needs to become a book for all to read. Every time we see her story we have a renewed opportunity to be amazed and grateful! I am blessed by knowing all of you and am blessed at hearing of Melody’s progress! 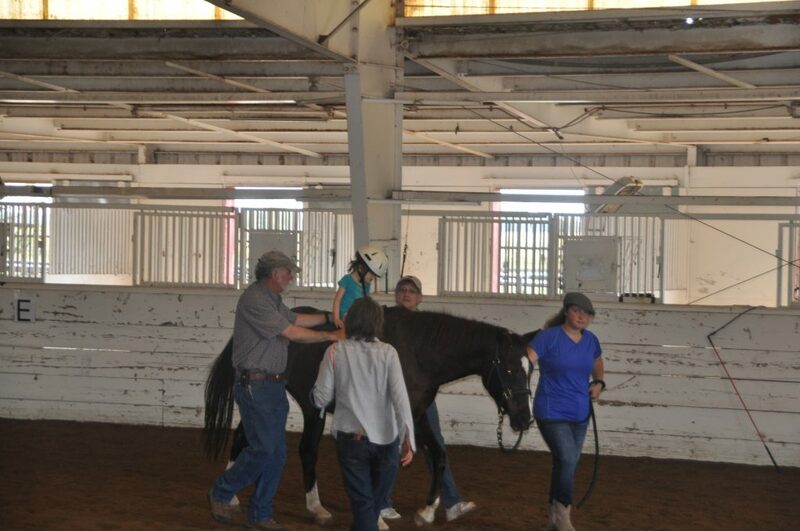 I am so excited about he progress with the gait trainer! So sweet! Loved everything you’ve done and the horseback ride was just awesome!! Yes, a book would be great! Hurray for your family! This was shared by a good friend/colleague-the one and only Miss Dana!! She is amazing isn’t she!!! Keep up the great work and having fun! Your story is inspirational! 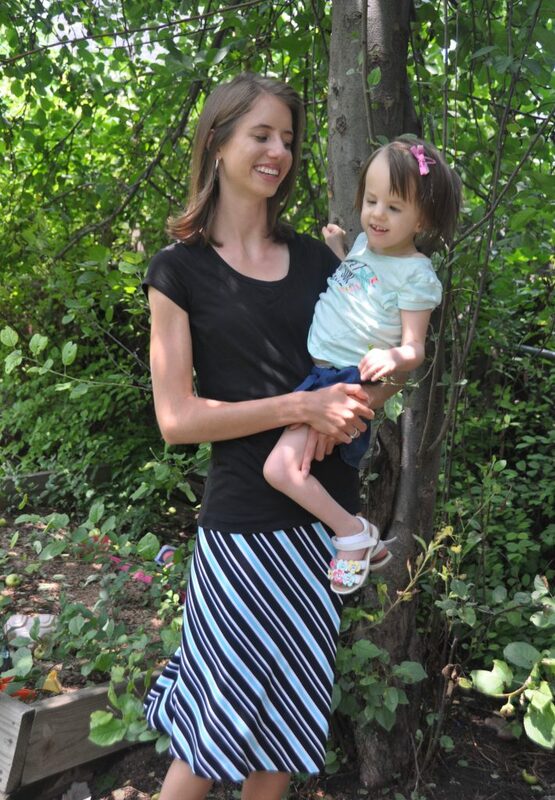 Reading about Melody’s progress is always uplifting, but this time, I am taken aback. She is now developing skills that build off of each other so quickly! Clearly, your never-ending search has taken your family, including the therapists who have been involved, on a marvelous journey of achievement. I thank you for explaining so clearly the effort this has taken because readers need to know that Melody is not just riding on a horse, for example; it takes great muscular work for her to hold her body in position, to use her legs to grip, and the results are stunning. 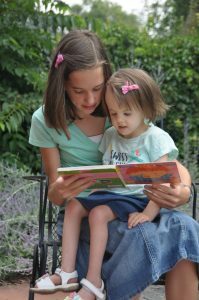 As a speech pathologist, I can see how improved her communication is – the intents, the vocalizations – and I am thrilled. As always, THANK YOU for sharing these fantastic moments, and yes, I will buy the book! So wonderful to read this update!! Praise God!! Thank you for giving her a chance, and allowing her to accomplish great things by God’s grace. Thank you for making sure that I saw this post! I am so blessed by this remarkable improvement! How wonderful! It absolutely astounds me. So grateful for her progress, her life. Go, Melody, Go! Blessed beyond measure to read this sweet Melody update! Tears of joy welled up as I read about your precious Melody giving the picture of you, Jenn, a kiss! Wow…what a beautiful gift! Your faith and our Loving God is so clearly present! You are an intentional Momma that has inspired me and so many others! May you keep reaching and celebrating victories with Miraculous Melody!